My name is Marilyn McLeod. At the present time I am the Health Director. The MoCreebec Health Department serves the community and provides quality programs and services, which meet the holistic needs of individuals, families and community. We offer programs and services that reflect the current and future health priorities of the community. 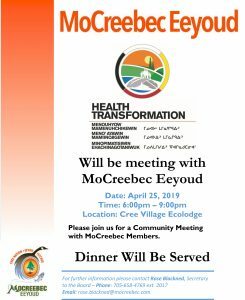 The MoCreebec Health Department is committed to improving the lives of its members through offering a wide range of services that allow for healing and empowerment. We provide services through the Healthy Babies/Healthy Children Program. This program works with families that have children ages 0-6. Mocreebec Health holds an agreement between Payukotayno: James & Hudson Bay Child & Family Services. We have a Family Service Worker on-site that provides one-to-one counselling sessions with individuals and/or families. Ensure integrated & coordinated care for sectors that include the children & families by coordinating human service sectors. (i.e., health, social services , education, justice and employment etc.,). We assist in coordinating with the Community/Region various Conferences/Summits and Seminars relating to Regional Health within our catchment area on an annual basis. We represent MoCreebec Chief & Council on various regional Boards (i.e. WAHA, SHL, JHBCFS. We network with the community agencies to build a stronger and healthier community. We are also available on an on-call basis should a crisis occur in the Community. Our mandate is quite interesting despite limited funding. We provide services through the Healthy Babies/Heathy Children program of which Catherine Reuben is the HB/HC Support Services Worker. Services through this program are provided to children 0-6 years of age. Another agreement that Mocreebec Health administers is between James & Hudson Bay Child & Family Services for the membership. We also assist in coordinating with the Community/Region various conferences/Summits and seminars relating to Regional Health within our catchement area on an annual basis depending on what the community sees fit and open to the public. 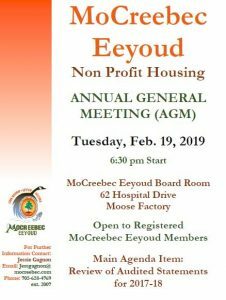 We represent MoCreebec Chief & Council on various regional Boards (i.e. WAHA, SHL, JHBCFS etc.,). We also network with the community agencies within our portfolio on issues of concern.